Proper nourishment is a critical ingredient for health and wellness. Here’s how to take advantage of the FS lifestyle to keep the nutritional bar high. The demanding work and frequent moves required of Foreign Service professionals and their family members often mean that eating well gets left behind. 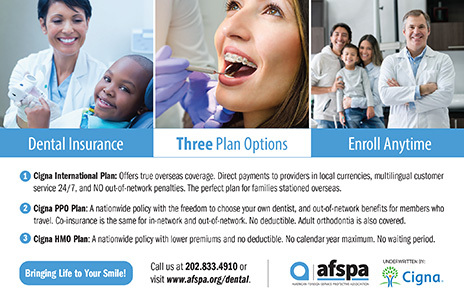 Health and wellness are increasingly recognized as essential for protecting and strengthening the Foreign Service’s most important asset—our healthy, high-performing people and their families. But while the department offers guidance and support for dealing with moves, family member employment and returning from high-stress posts, there is little guidance on nutrition for members of the Foreign Service. I began delving into cooking and nutrition during the three years I spent in Bordeaux, where my spouse was the American presence officer working to advance U.S. interests in a region of six million people in southwestern France. Bordeaux is known for its wine, but it is also a region where you can still find traditional ways of growing and preparing food. Through learning to cook with French chefs, farmers and grandmothers, apprenticing with a Basque butcher and studying with winemakers, I began to see how their “ancestral” approach to food can bring greater health and balance to our hectic modern lives. The traditional French recipes I learned were based on unprocessed, nutrient-dense foods. Contrary to recent conventional wisdom, the energetic chefs and spry grand-mères embraced traditional fats—butter, lard, duck fat—as the foundation of good cooking and nutrition. Moving away from the low-fat paradigm is also a tenet of the primal, paleo and “real food” movements that have gained popularity in recent years. 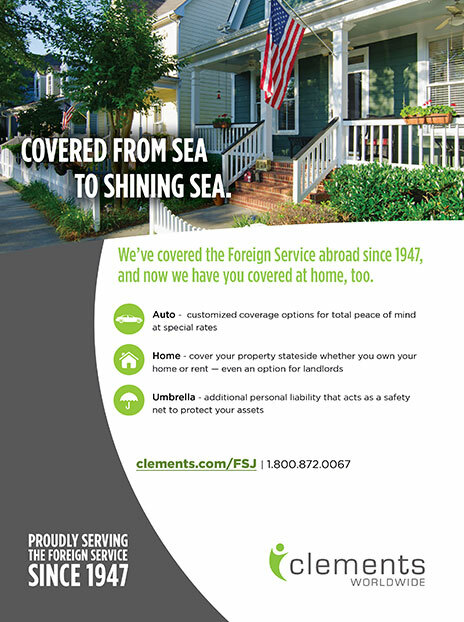 In the Foreign Service, we do our best to feed ourselves and our families well, often in challenging circumstances. 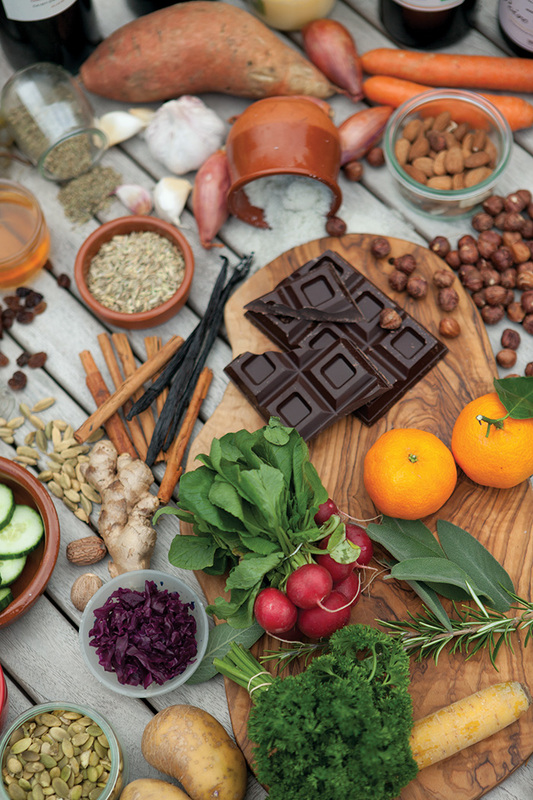 Whatever your situation, there are ways you can draw on ancestral traditions to make your diet more nourishing and satisfying. The benefits from even the smallest changes can be significant: greater energy, sharper focus, fewer cravings, better sleep, loss of excess fat and weight, not to mention reducing your risk of chronic diseases. And for children this can mean better health, better concentration and better behavior. Here are the pillars of this approach to eating well. 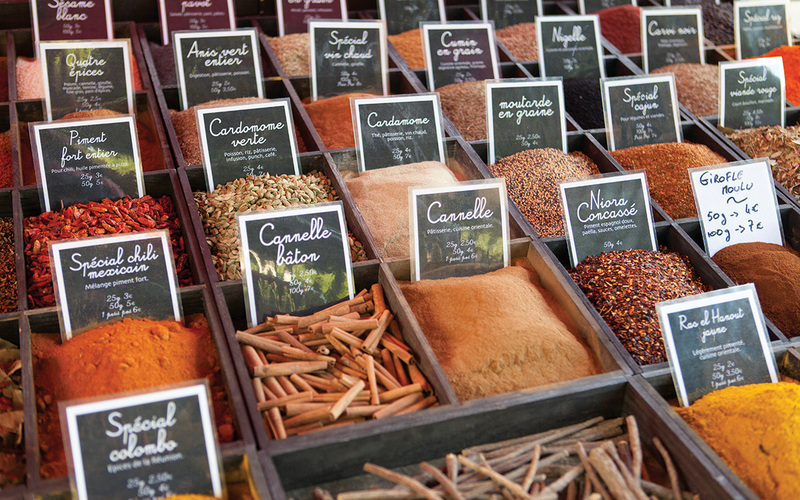 Spices for sale at an outdoor market in Aix-en-Provence. Refined sugar, grains and industrial vegetable oils entered the modern diet only in the past 150 years. Our bodies did not evolve to consume vast quantities of processed foods. Commissaries are convenient and comforting (we spent six Moscow winters grateful that we had a commissary), but remember that nutrients are often lacking in anything that comes premade in a box, can or plastic package, or that has a multiyear shelf life. • Watch out at receptions and parties. Caterers and restaurants often use low-quality ingredients and cooking oils to save money, and many hors d’oeuvres lack nutritional value. • Need a snack? Have beef jerky, salami slices, cheese cubes, veggie sticks or raw, sprouted nuts handy instead of chips. • Drop the soda and juice habit. It can be a comfort at a farflung post to have a taste of home in your favorite soda or juice, but you’re better off drinking plain water. Sodas that contain sugar substitutes harm the delicate balance of microbes in our gut. Sweetened drinks can spike your blood sugar and lead to drowsiness and cravings. And the expense of buying imported American drinks adds up! Hard to find clean water at your post? Many posts have water purifiers or bottled water delivery available on the economy. I learned from svelte and active French grandmothers that saturated fat from quality, natural sources can, in fact, be your dietary friend. I learned from svelte and active French grandmothers that saturated fat from quality natural sources can, in fact, be your dietary friend. Studies such as the 2016 Minnesota Coronary Experiment and the more recent international “PURE” study published in The Lancet suggest that saturated fat is not the villain it was once made out to be. In my own experience and that of my family and friends, a meal high in quality fats and low in sugars and grains is not only rich in nutrients, but promotes stable blood sugar and satiates, so one is less likely to snack. Try going back to a breakfast of bacon and eggs, or some combination of protein and fat (such as lunch or dinner leftovers), rather than low-fat yogurt or cereal, and see whether your energy levels and mood become more balanced. Dr. Catherine Shanahan, science director for the Los Angeles Lakers and author of Deep Nutrition: Why Your Genes Need Traditional Food, suggests embracing meat on the bone and slow-cooked meat dishes while avoiding industrial seed oils (e.g., canola, corn, cottonseed, soy, vegetable). She believes the polyunsaturated fat in these oils lingers in our blood stream and causes oxidation in our cells—like rust on a nail—which can lead to a host of health issues. According to Shanahan, our bodies are not programmed to break down these oils the way we can break down animal fats. I suggest replacing these industrial oils with more natural sources such as butter, duck or goose fat, lard, tallow, coconut, olive or avocado oils. These healthy fats are rich in nutrients, help you digest the fat-soluble vitamins in your vegetables and leave you feeling satisfied. 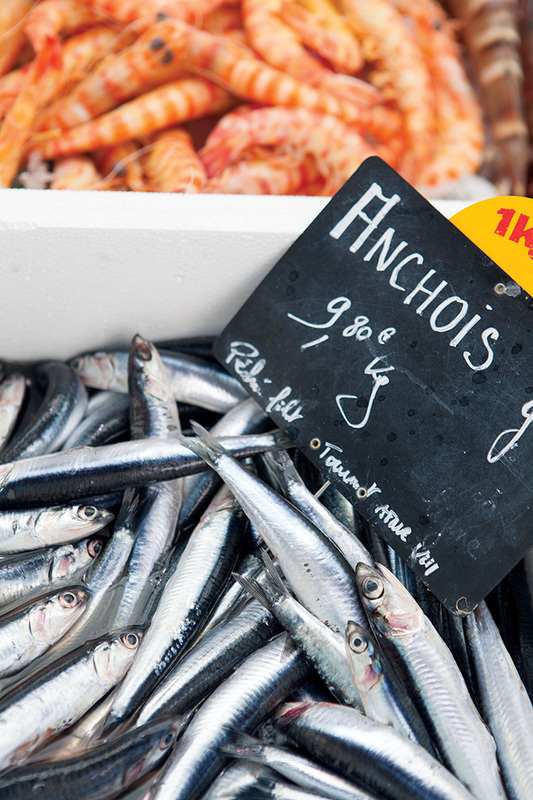 Seek out small, fatty, cold-water fish such as anchovies, sardines and mackerel. These are packed with nutrient-rich Omega-3 oils and, because they are lower on the food chain, may contain fewer heavy metals and toxins. Moreover, they are often among the least expensive fish at the market. 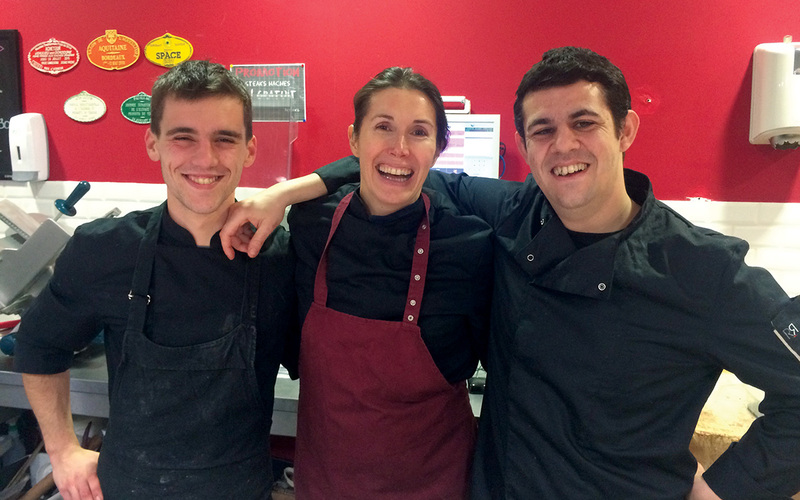 Butchers Florent (left) and Romain (right) with the author during her apprenticeship at an organic butcher shop in Bordeaux. The author at work in the butcher shop. Organ meats are nutrient-dense and are often less expensive than muscle meats. They are often readily available in many countries where FS personnel serve, where locals prize organ meats as delicacies—for good reason! Once you know how to cook them, livers, kidneys and sweetbreads are delicious and nutritious. If you’re squeamish, start with liverwurst or chicken livers. I got my daughters hooked on liverwurst last year, which they now spread on crunchy spelt or homemade grain-free crackers. We can learn much from the traditional cultures we encounter at many posts, which remain closely attuned to the rhythms of life, family and food. Take a break to enjoy your food and focus on really chewing each bite. (Chewed food is much easier on the digestive system, and the act of chewing prompts the digestive juices in your stomach). If you must eat at your desk, as many busy FS professionals do, at least turn off your screen to give your eyes a rest, and don’t use your phone. When possible, go for a walk during the day to get some sunlight. There is nothing a professional butcher loves more than for someone to show interest in the cuts of meat and how to prepare them. Consider it part of cultural immersion in your host country. Some markets around the world do not share U.S. refrigeration requirements for meats and fish, but frequently you can find a local store or service from which to buy refrigerated or frozen meats, if not a proper butcher. If there are no reliable local sources, work with your commissary or a local importer, and pool with other diplomats or expats to ship in quality meats and produce where possible. If you are in the D.C. area, consider joining an urban buying club like Joel Salatin’s Polyface Farms, which delivers grass-fed meat and pastured poultry and eggs to D.C.-area neighborhoods. Anchovies at an outdoor market in Aix-en-Provence. If you miss your nonstick pans, simply add more butter before you fry up your eggs. (Tip: Allow the pan and butter to get hot before adding the eggs.) This goes for sautéing vegetables, as well. Pack warm lunches for your children by investing in thermos containers and a reusable lunch box. This takes extra effort and planning, but a warm, home-cooked lunch helps kids concentrate at school and absorb the nutrients their growing bodies need. The French still practice this with positive results. Learn about local culture, traditions and dishes that have been passed down through generations at your post. I learned from the French culinary tradition to eat diversely and freshly, but also to share food in the company of family and friends. This slows us down, reduces our stress load and gives us memories to cherish. I learned from the French culinary tradition to eat diversely and freshly, but also to share food in the company of family and friends. My approach to food and nutrition works well for my family. But everyone has to find what works for them. What’s important is that you are deliberate in your food choices and preparation, and do not simply let them be dictated by prior habits or what’s currently on the store shelf. Allow yourself to enjoy the process of discovering what works for you, without preconceived notions or guilt. Try a small shift in habit and observe the results. If a less sugary breakfast seems to elicit better behavior from your child, well, there is an exciting new discovery! If taking a walk during the day helps you feel more productive, then take the time to do it. If bacon at breakfast allows you to get to lunch without snacking or becoming “hangry,” you and your colleagues will all be happier. As a community, we can benefit from each other’s commitment to health and nutrition. Rather than pushing ourselves on too little sleep and too much junk food, we can encourage each other to get the rest and nourishment we all need, but rarely allow ourselves. Even small shifts in thinking and behavior among members of our communities at home and at post can make for a healthier and happier Foreign Service. Taking small steps and leading by example might even get your child to eat her liver. I should have asked the French grandmothers for tips on that one! 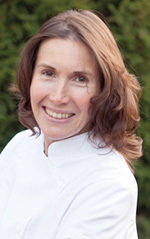 Tania Teschke is a writer and photographer with a passion for French cuisine and wine. She lived for an extended period in France as an undergraduate and graduate student, studying French language and literature and learning the art of traditional French cooking from French chefs and friends. 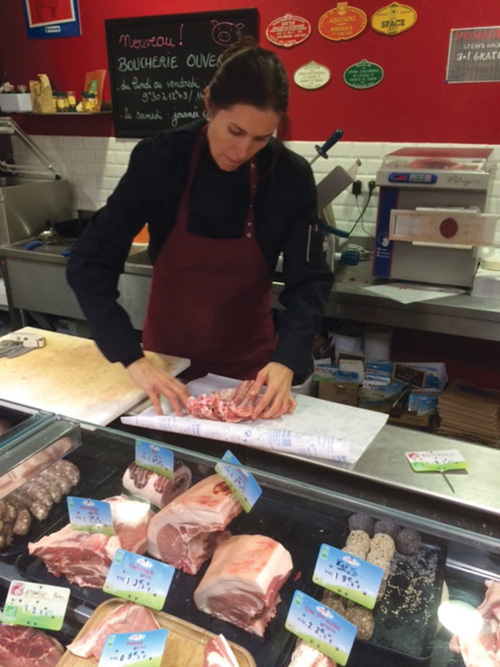 She apprenticed with an award-winning Basque butcher and earned a diploma in wine science from the University of Bordeaux. Her travel photography has been exhibited in Paris, Tokyo and Moscow and has appeared in The New York Times and other international publications. She previously worked with children’s book publisher Scholastic and with the World Wildlife Fund in Washington, D.C., and Frankfurt. Teschke is the author of The Bordeaux Kitchen: An Immersion into French Food and Wine, Inspired by Ancestral Traditions (Primal Nutrition, Inc., 2018). She lives in Switzerland with her FSO husband and two daughters. She blogs at www.BordeauxKitchen.com.